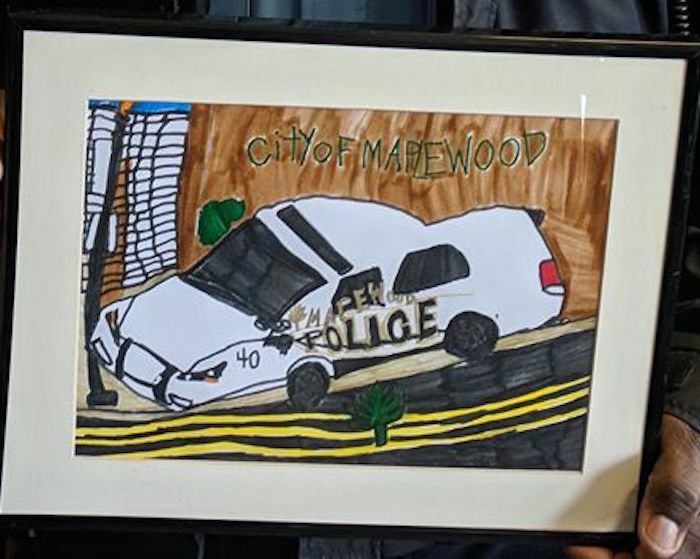 Artists First artist Danny Speck wanted to honor the Maplewood Police Department, so he painted a picture of a Maplewood police car. 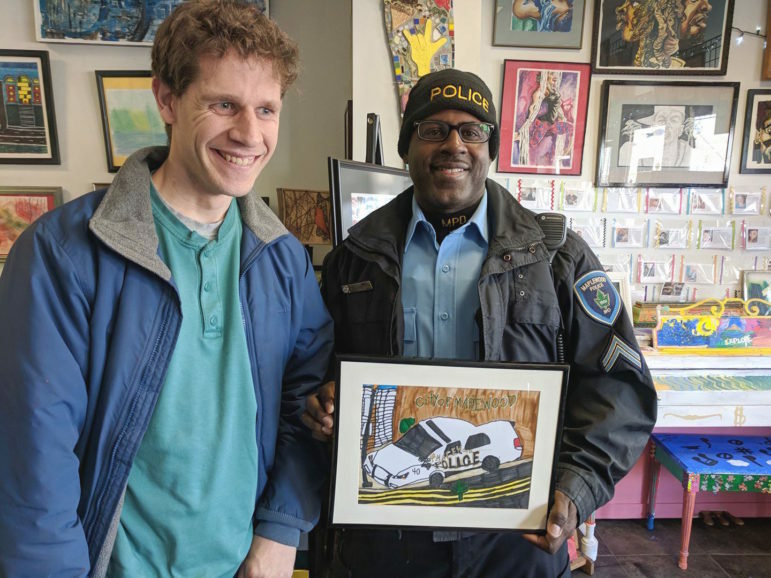 Maplewood Police Corporal Steve Jamerson liked it so much he surprised Speck and bought it. This is a correction. Previously it was said that the department bought the painting. Artists First is a non-profit art studio in Maplewood that provides a nurturing environment for people with a variety of disabilities including pervasive psychiatric illness, cognitive challenges, acquired brain injury, and post traumatic stress disorder. I am so proud of Danny! He was a student in my class for 3 years and I am so happy that he has found a venue to share his beautiful talent in with the STL community!! So many people create art for their own pleasure, but to see Danny create artwork of the people, places and objects around him that he finds joy in and is able to share it with others (and make an income) is a perfect example of a meaningful adult life. Keep your art work coming Danny. We need more of your artwork on our walls! This is exactly the kind of story that makes me proud to live in Maplewood. I’m going to have to stop in and check out Artists First. And how cool is it that one of our very own police officers decided to buy it? Thank you for all of the support! We invite you to stop in and visit the Artists First studio to take a tour, enjoy the artwork on display, and meet the artists and staff. I would buy this artist’s work in a minute and have something similar with a blue truck that I got in New Mexico. Gotta stop by the shop and look around! I agree with Daisy…also Rudy I challenge you to create a painting for the city! We all have our own idea as to what is good art. I would like to see yours. Thanks! That is a great painting! It would make a great t-shirt for Maplewood! I’m all for supporting non-profits, but spending taxpayer money on what’s comparable to a second grader’s artwork? Boy, I bet you’re super fun to be around. Re-read the article and try again, this time with less hate. You’re obviously NOT for supporting non-profits. Rudy, non-profit or not, would you make this comment if it were your son? It should be about building up the individual, not tearing down/humiliating him or her.